Happy Tuesday all! Today is super busy so this is going to be a quick, fly by post. 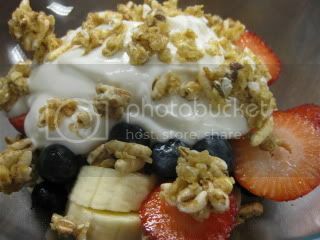 I had a fantastic Red, White and Blue Parfait to start my day. 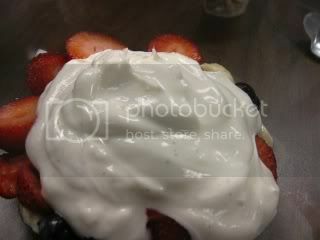 Topped with my absolute FAVORITE Organic Greek 0% Vanilla Bean Yogurt from TJ’s. Just check out the “flecks” of vanilla beany goodness in there. Layered with a sprinkle of Kashi Honey Almond Flax Granola. 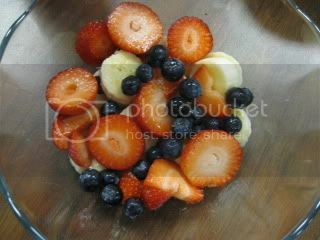 This was such a light and refreshing 4 Weight Watcher Point start to my day. I am so excited for my “planned” treat meal today ~ Thai food with my co-worker ~ Yahoo! Do you all LOVE Holey Donuts as much as I do?! If so, one lucky reader will be receiving THREE boxes in my giveaway. Put on your creativity hat and Click HERE to enter for your chance to win! Catch you all later for Thai fun, recipes and more! that is one patriotic breakfast if i've ever seen one! wow, her results are awesome! you have amazing taste in food and I will be coming back. You can never go wrong with fruit n' yogurt. I just found your blog….. it's really cute so far! Hope you don't mind if I return!! I'm always looking for food inspiration! oh k! i didn't know your were born on the 4th. this parfait is SO for k! haha..
love the colors and crunch factor. yummo! Jenny ~ Thanks, I should've saved it for July 4th – huh? Brandi ~ I know – she looks great. I wish I took pictures like that to see if I could see my results too! K ~ I didn't know that! I think I can remember your birthday now! Ok – I dedicate my breakfast for you. Janetha ~ It was fast and easy and crunchtastic! Anne ~ It definitely hit the spot!